Many people ask “Why do people use cocaine? One of the reasons that many people use cocaine is because they believe that it is not a harmful drug. They think using this drug will not have any adverse effects. Nothing could be further from the truth. The initial appeal typically lies in how that substance works in the brain and body, and the unique effects that set it apart from other substances. 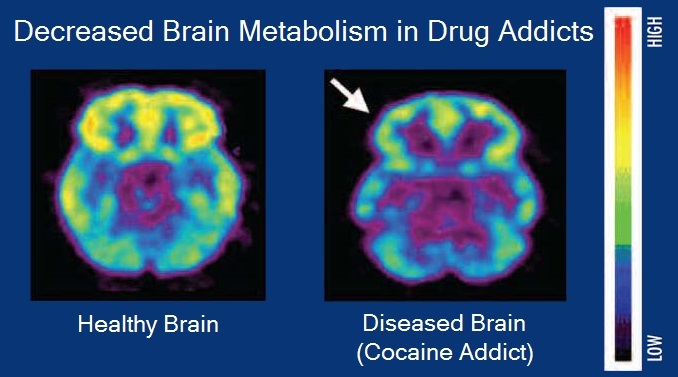 Since cocaine is a stimulant, it increases brain and nervous system activity. As it does, the brain floods with natural ‘feel good’ chemicals at unusually high levels, producing an intense sense of pleasure and reward, high energy and motivation, and a sense of confidence and mastery. People who turn to substance use, and who feel a lack of any of these qualities in their everyday lives, are particularly vulnerable to addiction or the use of other stimulants similar in their effects. It is a powerful but short-acting stimulant, designed to create euphoria. A white powder derived from the coca plant or Erythoxylon coca, stemming from coca shrub leaves, a plant from South America. Cocaine is a recreational drug, often referred to as coke, C or Charlie. Sometimes people purchase cocaine mixed with something like heroin, or another stimulant to amplify the effects. 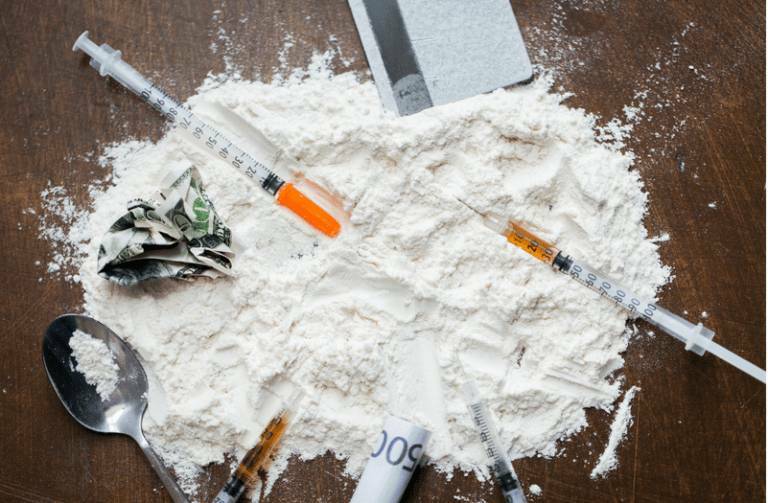 In most cases, people buying heroin on the black market have no idea what else it contains, so they’re putting themselves at risk because of that, as well as the effects of the cocaine on its own. For those in the throes of cocaine addiction, it comes in many forms. It can be smoked, snorted or taken intravenously in a solution. Crack cocaine is a free base; smokable version often referred to as crack. It is created by what is called “cooking” cocaine in baking soda and water, forming crystals or tiny rocks. People living with addiction can smoke through a so-called crack pipe; usually, a bong or an improvised item like a ripped open cola can. Crack cocaine addiction was rife in some US inner cities in the mid-eighties, and now its use, along with its availability has grown alarmingly. Official figures in the UK reveal that cocaine deaths have reached their highest numbers since records began. Last year reportedly, cocaine addiction levels in the UK saw drug poisoning deaths reach record figures. It had seen cocaine fatalities in parts of the country rise by 16% considered the highest since 1993. Records state most deaths occurred in men between the ages of 30 and 49. Many attribute the rise in mortality rates to a heightened purity of the drug, making it far more dangerous. The Office for National Statistics state that there were 432 deaths related to the Class A drug in 2017. Crack is considered the most effective form of the drug, i.e. the most addictive, where cases of addiction are so high we are said to be facing a crack epidemic. There was a time when some thought only the rich or famous could fall prey to cocaine addiction. However, there are thousands of people across the UK who may partake on the weekend or a night out. They may misguidedly believe alcohol and cocaine go together to make for an enjoyable evening. But alcohol and coke can be a dangerous combination. Statistics show you have twenty times more chance of sudden death if you take cocaine and alcohol together, rather than use coke on its own. One of the most serious problems with mixing alcohol and cocaine occurs when the two metabolise through the liver. The organ produces cocaethylene, which can build up in the body and put stress on major organ systems, particularly the cardiovascular system and the liver itself. You can help someone you know to get the help they need by recognising the signs of cocaine addiction. This will allow you to make a better assessment. There are many signs associated with cocaine addiction that can be observed in the person’s appearance and general behaviour. It’s important to also consider the long-term behavioural effects of addiction. Since cocaine is a stimulant, it typically causes the person using it to be very talkative, energetic and confident. It also creates a sense of improved well-being, which can lead them to be social, excitable and even more sexual. People on cocaine may seem “pumped up” for no reason at all. They may also have a diminished appetite, dilated pupils and disrupted sleep in many instances. Behavioural signs of cocaine addiction include paranoia, excessive aggression, lack of judgement, delusional thoughts and hallucinations. One of the main tell-tale signs of addiction is the presence of small, trace amounts of white powder appearing around their nose. Sometimes when people are on the drug, they will also get a runny nose. If someone uses cocaine for an extended period, they may get nosebleeds frequently. 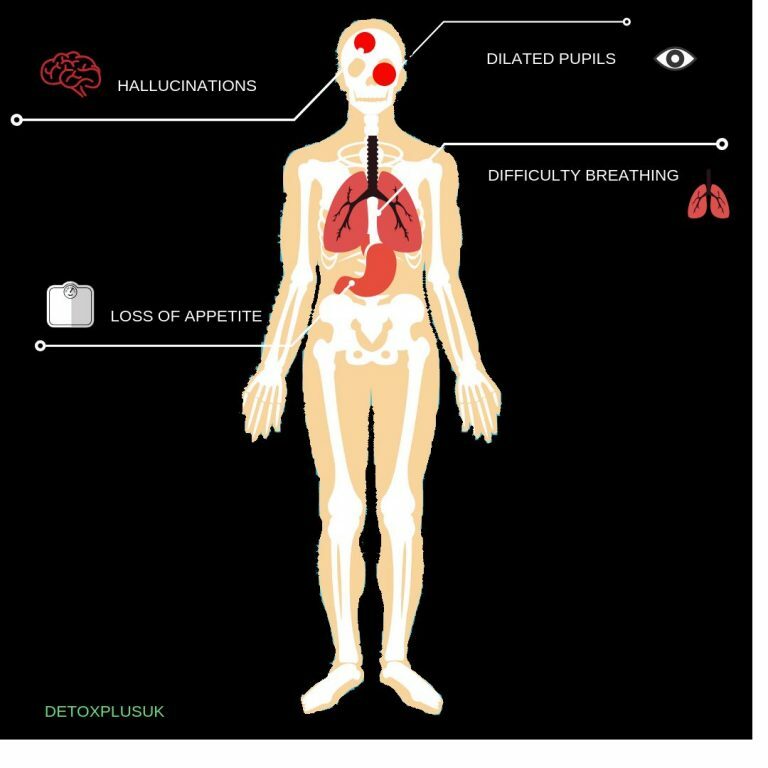 If someone injects the drug rather than snorting it, there may be physical signs of use, such as needle marks on various parts of the body, including the arms, legs, hands, feet, and neck. Someone who smokes cocaine may show physical signs of use such as burned fingers or lips. Some people are not fully aware of the short-term effects of taking the drug, which can partly lead to cocaine addiction. For instance, the substance creates a fleeting, intense high which instantly leads to a comedown, the classic drawback of addiction. It can bring on negative moods, edginess, and anxiety, along with insomnia and loss of appetite. They may also invariably feel cravings for more of the drug, resulting in addiction. Users must also be aware of the long-term effects of taking the drug. It can affect a person’s sleep pattern and cause them to lose weight by not eating, leading to malnutrition. Those living with cocaine addiction can suffer from various psychiatric problems. A large proportion of individuals seeking treatment display psychosis-related symptoms. They may suffer from irritability and mood swings to apathy, delirium and confused exhaustion. Addicts may experience tactile and auditory hallucinations, culminating in severe depression. When this occurs, ongoing psychiatric treatment may be needed. Users may also display the physical signs of cocaine addiction. These range from liver, kidney and lung damage to affecting the blood vessels in the heart and brain, among other ailments. Those taking the drug risk an increased heart rate, sweats, and enlarged pupils. There is an enhanced chance of addiction, blood infections and high blood pressure, which can lead to heart attacks and strokes, or even sudden death. What are the Dangers of Cocaine Addiction? There are risks in even administering the drug. Some choose to snort the drug, often called nasal insufflation. The drug, in powdered form, is regularly cut into lines and can be sniffed through a straw, a rolled-up bank note or a scrap of paper. However, for those either experimenting with cocaine or have an addiction, snorting can be hazardous. It can cause bleeding and widespread damage to the tissue around the nose and nostrils. The effects of snorting the drug can begin rapidly but may only last for up to half an hour. They can lead to physical conditions such as sinusitis, hoarseness, loss of sense of smell and problems swallowing, among others. Injecting the drug, otherwise known as “shooting” is considered the most dangerous method of administering the drug, were converting it into a solution creates the greatest levels in the bloodstream in the shortest amount of time. People with a cocaine addiction who take it through a needle may be forced to make various attempts. They may have to inject repeatedly, but it is harder the more they try. Injecting can result in numerous health issues, such as vein collapse or vasoconstriction, or the narrowing of the blood vessels. It can bring on ringing in the ears, audio distortion and tinnitus commonly called a bell ringer. Those battling cocaine addiction also face a danger of blood-based infections and a high risk of overdose. It is not hard to see how people can develop a cocaine addiction. It is the second most addictive drug in the world. It can lead to addiction because of the effect it has on the brain and its reward pathway. It is the site of the chemical called dopamine. Neurons in the brain communicate by releasing the dopamine when they feel pleasure. Dopamine then recycles back into the neuron. However, cocaine stops the dopamine from being recycled, and it begins to build up. Taking the drug causes huge levels of the chemical to be released, which makes a person euphoric. If the process is repeated too often though, it can alter the brains reward system, leading to cocaine addiction. A new scientific study suggests that the drug’s effects go beyond the dopamine system and that cocaine use had a significant impact on brain metabolism. Are you living under the shadow of cocaine addiction and require assistance? DetoxPlus is on the cutting edge of rehabilitation treatment, helping people find rehab treatment and turn away from addiction and start a new life. We at DetoxPlus offer a wide selection of rehab facilities throughout the UK and are here to support and help you overcome your cocaine addiction. Our treatment facilities provide fast, individualised substance abuse intervention. We cover treatment from detox, to primary rehab treatment. When you first have contact with our trained staff, we will be working to get you into treatment within the next 24 hours. Our treatment clinics are available to you almost immediately, and our professional staff at DetoxPlus are here 24 hrs a day to help you.